Notre Dame Cathedral on fire in the distance. That’s what a police officer said when describing the fire tearing through the iconic Notre Dame cathedral in Paris today. It’s a sentiment often shared by Christians describing not just the church in Europe, but society at large. there’s something profoundly humanising as we, together, across the spectrum of belief, or nationality, mourn the apparent destruction of something beautiful – not just because it is religious and so connects us to sacred truth, but because beauty has the capacity to transcend – or cut across – other barriers we might set up in our world. 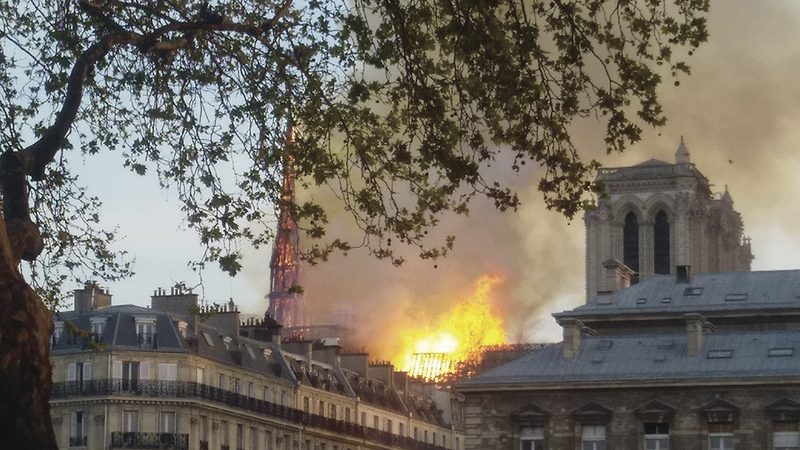 It’d be easy to take the Notre Dame fire, and our reaction to it, as something bigger and more symbolic than it is; and to co-opt the fire to fit all manner of narrative. To ask why people suddenly care about church buildings when they’ve long evacuated from ‘the church’ as the community of believers. To ask why in what philosopher Charles Taylor describes as our ‘secular age’ our instinct in these moments isn’t to jump to the hard secularism that celebrates the destruction of an archaic, oppressive, symbol, but to embody the ‘softer’ secularism that realises that in our modern age where we’re in danger of reducing life to something like biological machinery as part of a bigger technological or economic system, we actually need some sense of beauty and transcendence, or we’ve really lost something significant. Our transcendent ‘symbols’ like these grand pieces of religious architecture are like lodestones that hold us, and connect us, to some deeper truth. Beauty does that too – whether in art, humanity, or nature. So there’s something profoundly humanising as we, together, across the spectrum of belief, or nationality, mourn the apparent destruction of something beautiful – not just because it is religious and so connects us to sacred truth, but because beauty has the capacity to transcend – or cut across – other barriers we might set up in our world. I come from a tradition (I’m a Presbyterian) that reacted against an apparent idolatry at work in these grand cathedrals; their opulence in the face of human poverty, their ability to distract from the substance of the Gospel, their reinforcing of an ‘institutional’ Christianity where ‘church’ is a building or an event. But I’m increasingly convinced that the swing to utilitarianism in how we approach church and architecture – our understanding of the formative power of space; that habitats shape habits – reflects and reproduces a thin understanding of creation, both a devaluing of beauty and the arts, and a corresponding devaluing of the human body and the human person. It’s not just protestant iconoclasts like me who have issues with what Cathedrals might symbolise about truth, and particularly the truth of the Gospel; Cathedrals in recent times both here and abroad aren’t just synonymous with wealth that is disconnected from justice, but they have been the setting for some heinous, dehumanising abuse of people made in the image of God. It’s not the secular masses who ignore Mass in a cathedral that have desacralized these spaces, but the sacrilege of abuse, whether of power, or worse, of children. But perhaps the symbolism of these places goes beyond simply the power of beauty. Perhaps we’ve already lost something of the power of Notre Dame by disconnecting it from the Gospel story its cruciform (cross shaped) floor plan, is oriented towards. The steeple that collapsed this morning, like in most cathedrals, was positioned at the point where the horizontal and vertical arms of the cross intersect. The building was ‘cross centered’ at its highest point… something not captured when we now speak in hushed terms about its beauty or symbolic power. Macron’s analysis, and our collective grief, are all ‘true’ responses to the tragedy, it does affect us all, because of the role this building has played in stories that have shaped the human story beyond the borders of France, but it is, perhaps, a limited account of Notre Dame’s story, such that even a beautifully rebuilt Notre Dame will not be all it could be if its symbolism is limited to what Charles Taylor describes as the purely ‘immanent frame’ – the here and now. If the beauty of Notre Dame does not just transcend different human stories, but link us to God’s story, then it falls short of its created purpose. Because it’s possible that sacred spaces, like Notre Dame, function the way the beauty of the world is meant to, according to Psalm 19 or Romans 1, they’re a vision of creation oriented towards its created purpose – to reveal the divine nature and character of God – and so to not just shape how we understand God, but how we understand ourselves as those made in his image. It’s interesting to ponder whether we Australians could collectively imagine cold, utilitarian, camps for refugees if our collective imaginations were shaped by life giving and beautiful spaces that trained our hearts and minds to see not just the beauty of God, or his creation, but our fellow human. Ultimately the beauty of a cathedral is limited if all it does is reveal that we humans, made in the image of a creative God, are capable of imagining and creating beautiful things in and from the world God made; that we have, as Dorothy Sayers described it ‘the mind of the maker,’ if Notre Dame just one ‘sacred space’ in a world that increasingly wants to divide reality along ‘secular’ and ‘sacred’ to keep the sacred from encroaching on real life, or if it is just confined to re-presenting our history and our small stories to us, rather than God’s story. There’s a certain secular mindset that wants these symbols to remain forever present, forever unchanging, in the skyline, while never darkening the doors of the church; it wants the symbols, or forms, of Christianity to remain as part of our collective fabric, while the content evolves and is updated according to modern sensibilities. It’s in that testimony, and the resurrection of that temple, that we find hope in the ashes of the tragedy and destruction we witness in our world. For the Christian there’s more to the story than ‘everything is collapsing’, there’s the resurrected Jesus promising ‘behold, I am making all things new,’ secured by the Easter event, a story that should be told in the most beautiful spaces possible, but also in the ugliest, because it is a story of hope.